Look up granivore in Wiktionary, the free dictionary. 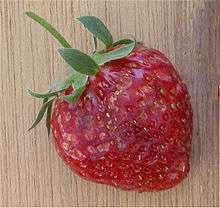 A strawberry aggregate accessory fruit damaged by a mouse eating the seeds (achenes). Seed predation, often referred to as granivory, is a type of plant-animal interaction in which granivores (seed predators) feed on the seeds of plants as a main or exclusive food source, in many cases leaving the seeds damaged and not viable. Granivores are found across many families of vertebrates (especially mammals and birds) as well as invertebrates (mainly insects); thus, seed predation occurs in virtually all terrestrial ecosystems. Seed predation is commonly divided into two distinctive temporal categories, pre-dispersal and post-dispersal predation, which may involve different strategies and requirements and have different implications at the individual and population level. Nevertheless, regardless of timing, seed predation has great implications for plant population dynamics. To counterbalance effects of predation, plants have evolved defenses such as seed morphology (size, shape, toughness) and chemical defenses (secondary compounds such as tannins and alkaloids) to defend against their seed predators. However, as plants have adapted defenses to seed predation (e.g., chemical compounds), so have seed predators adapted to plant defenses (e.g., ability to detoxify chemical compounds). Thus, many interesting examples of coevolution arise from this dynamic relationship. Most humans are predominantly granivores, even if they eat a wide variety of other foods. Plant seeds are important sources of nutrition for animals across most ecosystems. Seeds contain food storage organs (e.g., endosperm) that provide nutrients to the developing plant embryo (cotyledon). This makes seeds an attractive food source for animals because they are a highly concentrated and localized nutrient source in relation to other plant parts. Some seeds have evolved strong anti-herbivore chemical compounds. In contrast to physical defenses, chemical defenses in seeds to deter consumption by seed predators by using chemicals that are toxic to granivores or inhibit the digestibility of the seed. These chemicals include non-protein amino acids, cyanogenic-glycosides, protease and amylase inhibitors, phytohaemaglutinins. Seeds face trade-offs between allocation toward defenses and the size and number of seeds produced. Additionally plants have trade-offs in seed defense allocation between deterring seed predators and attracting seed dispersers. Plants may reduce the severity of seed predation by making seeds spatially or temporally scarce to granivores. Seed dispersal away from the parent plant is hypothesized to reduce the severity of seed predation. Seed masting is an example of how plant populations are able to temporally regulate the severity of seed predation. Masting refers to a concerted abundance of seed production followed by a period of paucity. This strategy has the potential to regulate the size of the population of seed predators. Seed predation often occurs at contrasting plant ontogenic stages. Predispersal seed predation takes place when seeds are removed from the parent plant before dispersal, and it has been most often reported in invertebrates, birds, and in granivorous rodents that clip fruits directly from trees and herbaceous plants. Postdispersal seed predation arises once seeds have been released from the parent plant. Birds, rodents, and ants are known to be among the most pervasive postdispersal seed predators. Furthermore, postdispersal seed predation can take place at two contrasting stages: predation on the ‘‘seed rain’’ and predation on the ‘‘seed bank’’. Whereas predation on the seed rain occurs when animals prey on released seeds usually flush with the ground surface, predation on the seed bank takes place after seeds have been incorporated deeply into the soil. Both pre- and post-dispersal seed predation are extremely frequent in nature. However, fundamental differences occur between the two. Pre-dispersal predators are most often specialists, as they are more likely to adapt to clustered resources. Predator specialization requires that these animals utilize specific cues like plant chemistry (volatile compounds), color and size to attack seeds. In addition, specialization requires that the life cycle of the predator match the production of seeds by the host plant. Therefore, animals with shorter life span, like insects, are more common pre-dispersal predators. Common insect groups of pre-dispersal predators are Coleoptera, Hemiptera, Hymenoptera and Lepidoptera. For this reason, a greater diversity of predators feed on seeds prior to dispersal. Nevertheless, there are important vertebrate pre-dispersal predators, especially birds and small mammals. Post-dispersal seed predation is extremely common in virtually all ecosystems. Given the heterogeneity in both resource type (seeds from different species are available), quality (seeds of different ages and/or different status of integrity or decomposition) and location (seeds are scattered and hidden in the environment), most post-dispersal predators have generalist habits. These predators usually belong to a diverse array of animals, such as ants, beetles, crabs, fish, rodents and birds. In addition, not only is the assemblage of post-dispersal seed predators diverse, but its composition varies considerably among ecosystems. The severity of predation rates also varies between pre- and post-dispersal predation. Although both types of predation can be extremely high, studies simultaneously evaluating both pre- and post-dispersal seed predation suggest that the latter is often more severe than the former. However, seeds already dispersed and not consumed have a chance to germinate, and seeds consumed could die regardless of predation due to constraints imposed by unsuitable germination sites. On the other hand, all non-dispersed seeds predated would be no more than a waste of energy by the parent plant. Therefore, the demographic impacts of pre-dispersal predation on plant populations are likely to be stronger than the impacts of post-dispersal predation. The complex relationship between seed predation and plant demography is an important topic of plant-animal interactive studies. Plant population structure and size over time is closely associated with the effectiveness at which seed predators locate, consume, and disperse seeds. In many cases this relationship is dependent upon the type of seed predator (specialist vs. generalist) or the particular habitat in which the interaction is taking place. The role of seed predation on plant demography may be either detrimental or in particular cases actually beneficial to plant populations. The Janzen-Connell model  is one of the most important studies of how seed predation may influence plant demography. The Janzen-Connell model illustrates how seed density and survival respond to distance from the parent tree and differential rates of seed predation. Seed density is hypothesized to decrease as distance from the parent tree increases. Where seeds are most abundant under the parent tree, seed predation is predicted to be at its highest. As distance from the parent tree increases, seed abundance and thus seed predation are predicted to decrease as seed survival increases. The degree to which seed predation influences plant populations may vary by whether a plant species is safe site limited or seed limited. If a population is safe site limited it is likely that seed predation will have little impact to the success of the population. In safe site limited populations increased seed abundance does not translate into increased seedling recruitment. However, if a population is seed limited, seed predation has a better chance of negatively affecting the plant population by decreasing seedling recruitment. A study by Maron and Simms  found both safe site limited and seed limited populations depending on the habitat in which the seed predation was taking place. In dune habitats seed predators (Deer mice) were limiting seedling recruitment in the population, thus negatively affecting the population. However, in grassland habitat the seed predator had little effect on the plant population because it was safe site limited. In many cases seed predators support plant populations by dispersing seeds away from the parent plant. By dispersing seeds away from the parent plant the seed predator is in effect supporting gene flow between populations. Other seed predators collect seeds and then store or cache them for later consumption. In the case that the seed predator is unable to locate the buried or hidden seed there is a chance that it will later germinate and grow, supporting the species dispersal. ↑ Hulme, P.E. and Benkman, C.W. (2002) Granivory. In Plant-animal Interactions: An Evolutionary Approach, ed. C.M. Herrera and O. Pellmyr. Oxford: Blackwell. ↑ Janzen, D.H. (1971) Seed predation by animals. Annual Review of Ecology and Systematics, 2, 465-492. ↑ Janzen, D.H. (1970) Herbivores and the number of tree species in tropical forests. American Naturalist, 102, 592-595. ↑ Connell, J.H. (1971) On the role of natural enemies in preventing competitive excusion in some marine animals and in rainforest trees. In Dynamics of Populations, ed. P.J. den Boer and G.R. Gradwell. Wageningen: Center for Agricultural Publishing and Documentation, pp. 298-312..
↑ Fedriani JM and Manzoneda A. 2005. Pre- and post-dispersal seed predation by rodents: balance of food and safety. Behav. Ecol. 16: 1018-1024. ↑ Janzen, D.H. (1970) Herbivores and the number of tree species in tropical foresets. American Naturalist, 102, 592-595. ↑ Maron, J.L. and Simms, E.L. (1997) Effects of seed predation on seed bank size and seedling recruitment of bush lupine (Lupinus arboreus). Oecologia ,111,76-83. ↑ Harper, J.L. (1977) Population Biology of Plants, New York: Academic Press. Herrera, C.M. & O. Pellmyr (eds.) 2002 Plant-Animal Interactions: An Evolutionary Approach. Blackwell Science, Oxford. Hulme, P., and C. W. Benkman. 2002. Granivory. Pages 132-154 in Plant-animal interactions: an evolutionary approach. C. Herrera and O. Pellmyr, eds. Blackwell Scientific Publications, New York. Alexander, H.M., Cummings, C.L., Kahn, L., and Snow, A.A. 2001. Seed size variation and predation of seeds produced by wild and crop–wild sunflowers. American Journal of Botany. 2001;88:623-627. Andersen, A.N. 1989. How Important Is Seed Predation to Recruitment in Stable Populations of Long-Lived Perennials? Oecologia, Vol. 81, No. 3, pp. 310–315. Berenbaum, M.R and Zangerl, AR. 1998. Chemical phenotype matching between a plant and its insect herbivore. Proceedings of the national academy of sciences, USA, 95, 13743-13784. Brown, J.H., and E.J. Heske. 1990. Control of a desert-grassland transition by a keystone rodent guild. Science 250:1705-1707. Brown, J.H., Reichman, O.J., and Davidson, D.W. 1979. Granivory in desert ecosystems. Annual Review of Ecology and Systematics, Vol. 10, pp. 201–227. Figueroa Javier A., Muñoz Alejandro A., Mella Jorge E., Arroyo Mary T. K.. 2002. Pre- and post-dispersal seed predation in a Mediterranean-type climate montane sclerophyllous forest in central Chile. Australian Journal of Botany 50, 183–195. Sallabanks, R. and Courtney, S.P. 1992. Frugivory, Seed Predation and Insect- Vertebrate Interactions. Annual Review of Entomology. 37:337-400. Smith, CC. 1970. The coevolution of pine squirrels (Tamiasciurus) and conifers. Ecological monographis, 40, 349-371. Vander Wall, S.B., Kuhn, K.M., and M.J. Beck. 2005. Seed Removal, Seed Predation, and Secondary Dispersal. Ecology, Vol. 86, No. 3, pp. 801–806.